Posted by David Macdonald under debt, economic risk, financial markets, financial regulation, household debt, housing, interest rates. 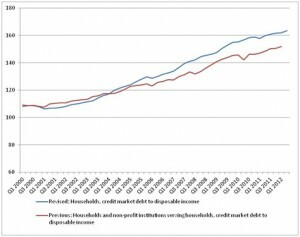 Canadians are now more indebted than either Americans or the Brits at the peak of their housing bubble.Â Statistics Canada today revised the national accounts.Â The result on the household debt front was that instead of Canadian households having a debt to disposable income ratio of 154, it has now been revised upwards to 166. The new data allows better disaggregation of non-profits and households that were previously lumped together.Â The lower debt ratios of non-profits were making the entire sector look like it had less debt.Â Now that households can be pulled out and examined specifically, the amount of debt they are carrying turns out to be much higher than previously thought. With the new higher personal debt ratio of 166%, Canadian households are now more indebted than Americans were at the peak of their housing bubble in 2007 when their household debt ratio hit 165%.Â The British were also riding high on household debt when they hit their peak debt to disposable income ratio of 160% in 2008.Â For both of these countries the ratio has declined significantly since the peak and appears to be a downward trajectory. Looking at the revisions themselves and focusing in on the credit market debt to disposable income, not just total debt to disposable income, the revisions start to really alter the data in 2005.Â After 2005, the divergence between the pre and post-revision data widens.Â The first quarter data for 2012 reported household credit market debt to disposable income of 152%, the revised data for the second quarter of 2012 puts the figure at 163%, an 11% point increase. It is increasingly clear from these new figures that Canadians are overleveraged, as of this quarterâ€™s data, more so than the Americans or the British at their housing bubble peak.Â The household debt situation is going from bad to worse in Canada with no clear signs that debt accumulation is slowing.Â Given continued emergency low interest and mortgage rates, the situation, at least in the short term, may well be sustainable.Â However, as indebtedness continues to grow for Canadians, their overleveraging and eventual exposure to higher interest rates becomes more dangerous. While we may want to blame a variety of factors for getting us here, slashing of CMHC insurance eligibility rules, falling mortgage rates, lax bank lending standards and eager homebuyers, we are here now.Â The question for the future is how we can stop additional debt accumulation while at the same time largely maintaining home equity as the primary asset for retiring baby boomers. The operative word is “largely.” BBs have been borrowing off fictional, inflated home values for awhile, which will be devastating to existing equity once prices (inevitably) crash. If prices don’t crash, then that debt will get handed down to their kids in the form of overinflated mortgages. Take your pick. You’re more pessimistic than I am Renee. Its certainly true that retiring baby boomers could do well if they sold now. The issue is that for many baby boomers, their house is their primary retirement asset. Simply crushing asset values of middle class retirees is a hard pill to swallow. I’d argue for a middle path, stop house price appreciation but put a bottom on depreciation at say 20%. 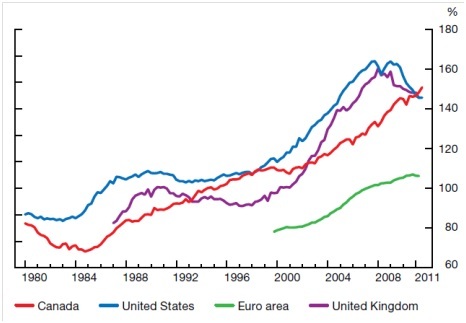 I wonder how such deflationary house prices will impact property tax based on housing assessments and valuation. Given the data problems that have been recently uncovered at CMHC, we could see some truly overvalued pricing, both real and data distortion wise come back and could be a massive hit to both home owner assets values, and local governments revenues. The CMHC shoukd have known better, than to implement such a error prone mechanism in such turbulent waters. Very irresponsible. You would think that given the market values involved, having a more balanced and real approach to such massively important economic responsibilities would have been prudent. But given the shuffling in of Tory sympathizes within the upper management positions, especially at the chief economist level, who could be surprised by such incompetent actions. One always needs a couple of legitimate methods people deep I side the process, it cannot be all politics all the time, there is a truth that is out there people. Of course this is merely an aside to the real problem at hand, that is harper’s, bring on the resource extraction, destroy all value adding parts of the economy, dutch disease approach to economic disaster. Slow the bitumen super highway and build refineries in Alberta and other parts of Canada, that would be a start in easing the decline. Underneath the debt crisis is a rotting neo- con wage stagnant, race to the bottom economy, and until Harper addresses these forces, the bubble will become unmanageable. But it does not have to be this way, not at all, this is deliberate inability for the current econ ic lever pullers to be pragmatic. What next from the BOC raise interest rates? That would be like pouring gas on your housing bubble bonfire, step back folks, as it seems that is exactly what the idiots at the BOC are recommending, burn it all down!!!! Just pipelines will remain. The trajectories are telling and the economic disaster plan being implemented that will keep our dollar lofty will be afford no braking mechanism to these trajectories of debt and decline, just accelerators. We need new tools, and I kind of hate calling Tom Mulcair a tool, but he is! And if he listens to us on the Pef, he will be a good tool. Paul I largely agree with you. The one point on property taxes and the effect on municipal income is a mute one, in Ontario at least. For Ontario munis, the mill rate adjusts for average changes in property valuations. So if in Toronto, the average home value goes up 10% in a year, the mill rate automatically goes down 10% to adjust. The inverse is also true so falling house prices will not affect muni revenues, well at least through the property tax system. In Ontario and probably elsewhere, the property tax system is design to exclude the effects of valuation increases or decrease. For example, if all properties decrease 20% in market value, property tax rates automatically increase by 20%. Because a property owner ends up paying the same it isn’t counted as a tax increase. Okay I stand corrected. Thanks did not know that. There still is a problem however with the rather loose methods employed by the CMHC in housing valuation, as it seems, from what has been written, to have implemented a method, that introduces a bias and skews the values to the high side, which when compounded and passed through the system, could mean some very regional or local painful adjustments when housing values get more of a correction and more of a caustic market focus. and by the way regardless of local tax mechanisms, Tom Mulcair is still a big tool, and many should think about that, at least for the next 3-4 years- and so should his handlers when they rethink economy and society progressives and their history- recall what a tool is- a means to an ends. Tom is not the ends, but he could be the means to getting some sanity in this unfolding disaster that these trajectories throw us headlong into the fire. It- the grand payment for Harper’s mismanagement is coming- believe it- needless austerity and mismanagement of the housing bubble will ensure get there- just look at those trajectories and math will take care of the rest of it- do a first derivative on most measures, and do a second to get even more bad news. I have stated this would occur, it exceedingly is proof. Lowering interest rates were clearly wrong. Inflation has not increased wages, salaries, incomes. Ignore inflation in assets prices, food, energy, tuition, healthcare, insurance fees, maintenance. Cost of living, and @ Paul T, you said I would be prooven, wrong, and again reading you’re comments you will tolerate higher prices, housing is too expensive, prices would have never increased without low borrowing cost, and the mortgages held by banks guaranteed by the BoC. My grandfather purchased his house for less then 5 thosand dollars in wages, when he was 19. Untill progressive admit prices regardless have increased from the past resulting in Canadians working longer hours for goods and services, taking out debt, substituting less quality, or going simply without any goods or services if they cannot do the former. Yes, higher interest rates are the solution, a Paul Vockler monetary policy prooven, to work in the 80s.